Great Salt Lake lake in northern Utah, U.S., the largest inland body of salt water in the Western Hemisphere and one of the most saline inland bodies of water in the world. The lake is fed by the Bear, Weber, and Jordan rivers and has no outlet. The lake has fluctuated greatly in size, depending on the rates of evaporation and the flow of the rivers that feed it. Its surface area has varied from about 2, 400 square miles (6, 200 square km) at its highest levels in 1873 and the mid-1980s to about 950 square miles (2, 460 square km) at its lowest level in 1963. At high level the lake’s surface is 4, 212 feet (1, 284 metres) above sea level, and at low level it is 4, 191 feet (1, 277 metres). At times of median water level, the lake is generally less than 15 feet (4.5 metres) deep, with a maximum depth of 35 feet (11 metres). Like the Dead Sea, the Great Salt Lake exists within an arid environment and has chemical characteristics similar to that of the oceans. It has a much greater salinity than the oceans, however, since natural evaporation exceeds the supply of water from the rivers feeding the lake. Surrounded by great stretches of sand, salt land, and marsh, the Great Salt Lake remains eerily isolated from the nearby cities, towns, and other human habitations, though in recent years means have been found to turn its apparent sterility to a profit in both economic and recreational terms. It has become important not only as a source of minerals but also as a beach and water-sports attraction and a wildlife preserve. 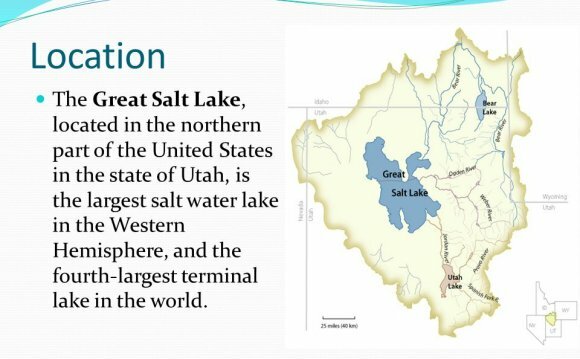 The Great Salt Lake is the largest of the lake remnants of prehistoric freshwater Lake Bonneville, the others being Bear Lake, on the Utah-Idaho border, and Utah Lake, west of Provo, Utah. Formed late in the Pleistocene Epoch about 30, 000 years ago, at high water covered almost 20, 000 square miles (52, 000 square km) of present-day western Utah and also extended into modern Nevada and Idaho. During succeeding glacial periods, large quantities of freshwater entered this intermontane basin and drained out through the Snake River—ultimately into the Columbia River and the Pacific Ocean. During the interglacial and postglacial periods, however, water levels decreased and the outflows were cut off. Water, therefore, could escape only through evaporation, and the mineral salts from the inflowing rivers remained trapped in the lake. The lake appeared on 18th-century maps of the continent through reports of explorer-trappers and Indian tales as a semilegendary body alternately named Timpanogos or Buenaventura, depending on the source. 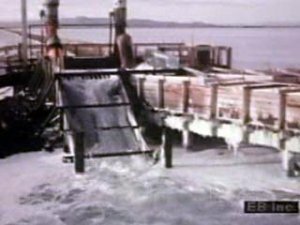 The first white explorers whose accounts are fully credited were the trappers Étienne Provost and Jim Bridger, who came upon the lake independently in 1824–25. More detailed investigations were made by Captain John C. Frémont in 1843 and 1845. The Mormons’ settlement in 1847 of their “promised land, ” on the nearby site of Salt Lake City, brought the region more fully into national awareness. The lake was surveyed in 1850, and in 1869 the last spike of America’s first transcontinental railroad was driven near the lake’s northeastern shore. The study of the Great Basin region by the U.S. Geological Survey in 1890 was an important source of information about the lake, and later studies have been led by that agency.